Knowing the many methods that consumers can use to find content on Google+ will help you determine a good marketing strategy. Finding content on Google+ can be as simple as typing in the search bar, but you and your potential customers can discover content in other ways, as well. Hashtags are simple keywords that start with a # (pound sign), followed by an easily searchable keyword. When you see them in your friends’ posts, the hashtags link to a page in Google+ search that shows everyone else on Google+ who has included that hashtag publicly (the effect is the same as if you had inserted the hashtag into the search field yourself). 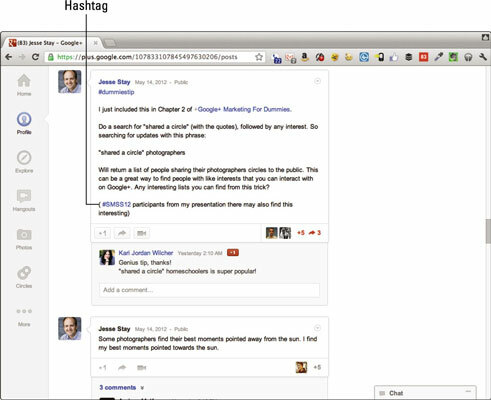 If you type in a hashtag in your own post, a drop-down menu shows similar hashtags being used on Google+. You can select one of the results or keep typing and use your own. After the post appears, the hashtag is hyperlinked in your own post. Use hashtags to organize a conversation around a specific event or topic. If you want to get all your friends talking about the same thing at once, use a hashtag. Google+ shows the most popular trending keywords at the upper right of your main Google+ stream. Like Twitter, Google+ calls these keywords trending terms. 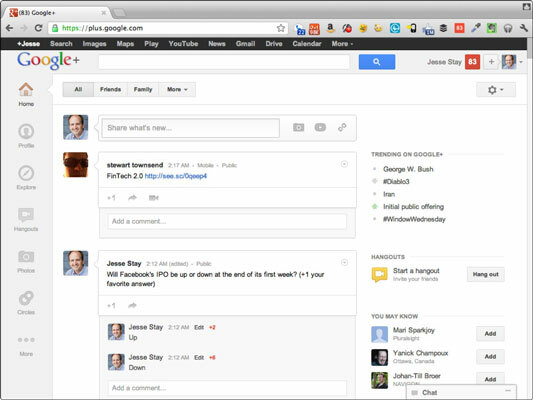 If you want to know what the rest of Google+ is talking about, look at this list. You can click the trending terms to see search results, and you can participate in a live conversation about particular terms with other people also mentioning the term on Google+. You can find friends and grow your audience when lots of people are looking at the same search results and the same conversation. Because Google+ is young, it is easier to get your own hashtags and keywords to appear as trending terms on Google+ because the audience is smaller. Take advantage of this situation while you can. It won’t last long — Google+ is growing pretty fast.